Streaming link provided by publicists. In cinemas nationally now! Knock is an adaptation of the much-loved Jules Romains play from 1923, Knock ou le Triomphe de la médecine. 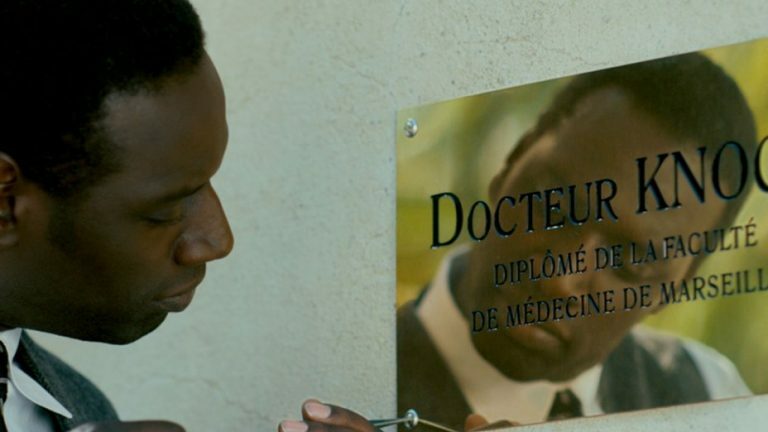 Now set in the 1950s, the tale follows the money-making journey of charming conman-turned-doctor, Dr Knock (Omar Sy). Dr Knock takes a job as a doctor on a cruise ship, despite never having studied medicine, and instantly realises how easy it is to convince healthy people they are sick and make them pay for treatment. Five year’s later, Dr Knock is a qualified doctor and arrives in the quintessential French country village of Saint-Maurice to replace the retiring Dr Parpalaid (Nicolas Marié). It is quickly uncovered that the village has a wealthy, ageing population who are mostly healthy but, in Dr Knock’s mind, easy to convince otherwise. Dr Knock strikes up a deal with the local pharmacist and almost immediately, both have booming businesses. The villagers are convinced they are suffering life-threatening but curable illnesses, as long as they follow Dr Knock’s instructions and continue to pay him for them. Knock is a pleasant film to watch with an interesting concept, however the film feels superficial and lacks the depth to convert it into a compelling exploration of human behaviour. There is little, if any, backstory to Dr Knock, making his motives simple yet unexplainable beyond the apparent assumption that everyone just wants to be rich. His idea to convince people they’re sick when they are not comes too fast and out-of-nowhere, and with too immediate success – there is no build-up of planning and it is unclear how or why he devised the scheme. Throughout the film Dr Knock appears to suffer no remorse or internal conflict regarding the morality of his actions which creates a very one-dimensional character. In spite of the flaws in the writing of the story, the acting is great and the film does effectively portray the power of authority and a white lab coat. All the villagers – except the priest who sees straight through the doctor’s sly charisma – believe everything Dr Knock says without question, simply because he is a doctor. His most notable healthy patient, who first develops a limp and then becomes bedridden merely because Dr Knock tells her she should be suffering from an imaginary childhood accident, is a prime example. Saint-Maurice is a beautifully picturesque village, and the costuming and set design are lovely to watch. The film perfectly captures the essence of small villages, with a sense of gossip and rumour constantly floating in the air. References to war highlight the socio-cultural atmosphere of the time period the film is set in. Surprisingly, however, almost no mention was made of Dr Knock’s skin colour despite being the only black person in the town in an era when racism was highly prevalent. Director Lorraine Lévy has altered the play by presenting Dr Knock as a young black man, instead of the traditionally older, white gentleman from earlier versions of the story. Whilst it could be argued that the casting of a black actor as the lead role is a positive step for film diversity, the move has interesting connotations when considered within the current climate of diminishing trust towards older, white men. In this sense, Lévy’s casting has repositioned the coloured man as dishonest and the subject of blame, ignoring society’s efforts to shift this. Overall, Knock glances over the real issues it raises, at best ignoring them and at worst approving of them. The film has a disappointing moral angle and channels a distasteful sense of anger towards an innocent and accurate individual whilst praising a manipulative criminal. Watch this movie for an enjoyable 1950s flick, with a touch of crime and a touch of romance, but don’t watch it for its ideas and values.